Ten things we didn't know about The Beatles and their Irish links until now. Beatles Radio: The Beatles, Solos, Covers, Birthdays, News The Fab 4 and More! 1. 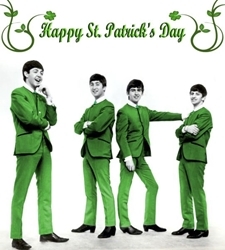 The Beatles first fan was Irish. The Beatles Tune-In author Mark Lewisohn tracked down Pat Moran who was originally from a strict Irish Catholic home in Liverpool. In a letter written to Pat from 1960 Paul McCartney described her as the band's "number one fan." As Lewisohn suggests something in The Beatles story touched Pat deeply, her father wasn't such a fan sending his daughter to confession after committing the "sin" of chattering about The Beatles non-stop. She sent food parcels, gave them money and even arranged a holiday for the struggling musicians before losing touch when joining the Royal Air Force. 2. The notoriously private George Harrison came from an Irish Catholic family on his mother's side. Unusually for the time his grandparents never married. The Beatles Tune-In author suggests the secretive aspect to his family and their suspicion of "nosy neighbours" had a lasting effect on Harrison's attitude. 3. John Lennon's mother Julia survived an IRA bomb on 3rd May 1939. Julia Lennon worked as an usherette in the Trocadero cinema where one of two tear-gas bombs went off that night. There was no loss of life but fifteen patrons were treated in hospital.